It happened again. The bananas went bad after Ryan and I figured we could eat a tree’s worth in one week. Instead of peanut butter banana stuffed french toast, I thought I’d be everyone’s favorite girlfriend in our apartment and make banana bread. There are few better smells than warm banana bread coming out of the oven. Carbs are my serious, serious weakness though, so I thought I’d made a lighter version of normal banana bread. No butter here! No vegetable oil either! The secret to making this banana bread light and fluffy is to whip the egg whites. It seems like an unnecessary extra step, but it makes a world of difference. This is a great basic recipe, and can be altered to your preferences by trading walnuts for chocolate chips, cherries, even dried coconut. Preheat the oven to 350 degrees. Spray a standard loaf pan thoroughly with cooking spray. Set aside. In a medium mixing bowl, mix together the bananas, the 2 egg yolks and vanilla extract with a hand mixer. Thoroughly wash the mixing attachments; if there is any fat near egg whites they won’t whip! In a separate bowl, whip the egg whites to soft peaks. This can take up to 5 minutes on high speed. Add the sugar and whisk again to stiff peaks. The whites will hold their shape when you left the mixer away. Add the baking soda, cinnamon, salt, and all purpose flour to the banana mixture. Mix until just blended. Add the whole wheat flour and again beat until just blended. Add the egg whites and fold in with a spatula. You don’t want to flatten the fluffy whites after working so hard. Add the walnuts and continue to fold until everything is incorporated. Pour the batter into the loaf pan and spread evenly with a spatula. I like to place some walnuts just pressed into the top so that there is no confusion that there are nuts in the bread. Just a personal preference, but if you put 5 in evenly spaced, you’ll be able to slice it quite easily. Bake the bread for 60 minutes, or until a toothpick comes out clear. Let the bread cool until you can easily touch the pan with your hands, 20-30 minutes. Put a place on top of the loaf and flip. You can then flip again so that it is right side up. Slice and serve as it, or with peanut butter or cream cheese for a delicious breakfast for snack. 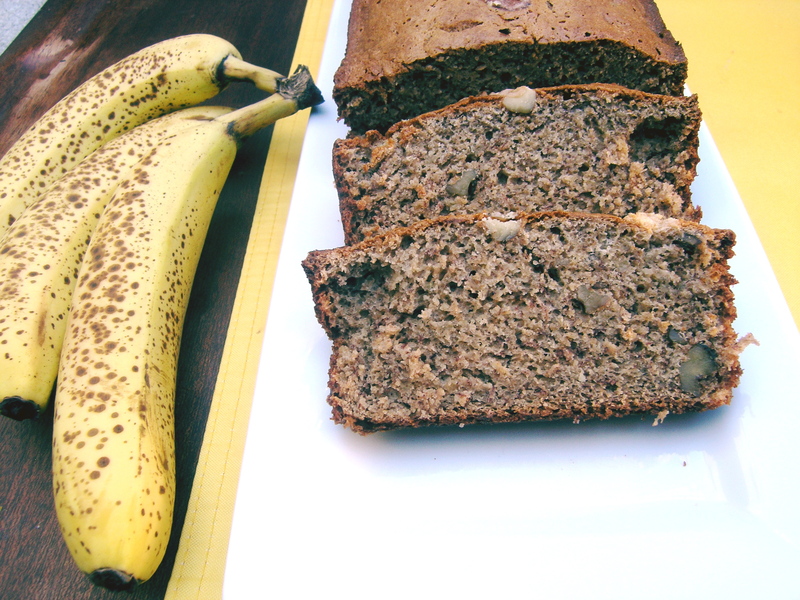 A few days ago I mashed up my very over ripe bananas and made a recipe with FAT! I look forward to making this recipe next time.